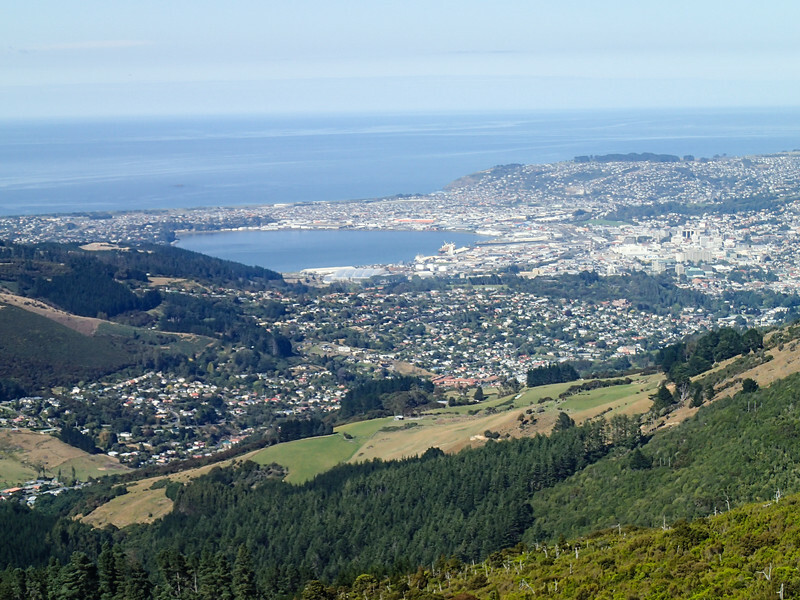 The Mt Cargill walk leads to a fine view of Dunedin’s coastline. A fun New Zealand walk. On long cruises with lots of sea days, Alan and I are always happy to put our feet on the ground once the ship is in port. Booking a cruise excursion that includes time in nature is even better. 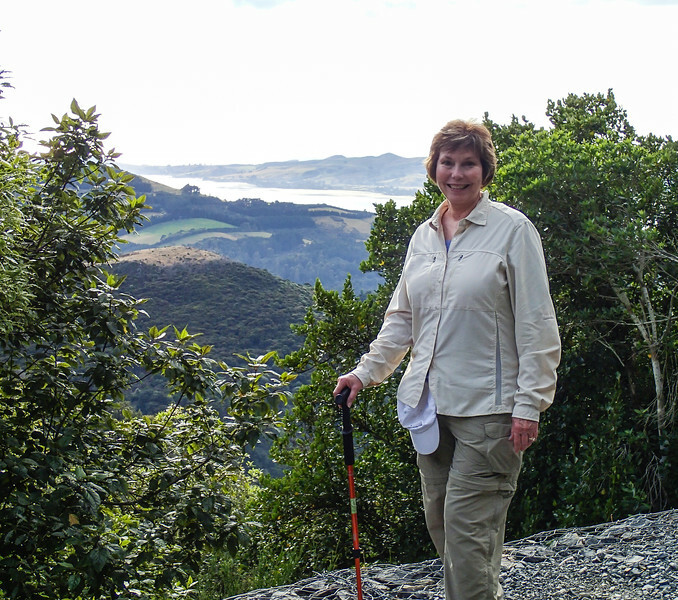 And that’s exactly what we did when we chose a Mt Cargill walk in Dunedin while on a Silversea cruise around New Zealand—part of a 62-day voyage through the Pacific. Be sure to book your adventure ahead of time on the Silversea site. We had booked a different excursion but changed our minds at the last minute. Luckily the Mt Cargill walk was still available. It was a comfortable ride in a mini-van to the beginning of the Mt Cargill walk. The guided walk (that’s what they call hikes in Kiwi country) to Mount Cargill and The Organ Pipes begins when Silver Spirit docks in Port Chalmers, the port for Dunedin. 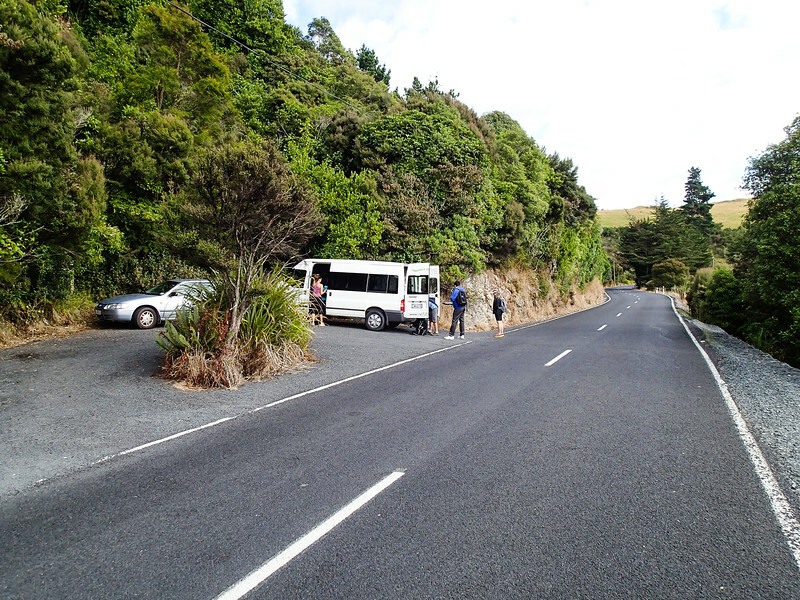 Adventure company, Wild Earth Adventures, meets participants at the Silver Spirit (there are 10 of us including staff) for the short drive in a mini-van through Port Chalmers and into the hills north of Dunedin, the hike’s starting point. Got my hiking pole and I’m ready to go. We haven’t even started on the trail but the view’s already outstanding. Before getting out on the trail, the guide offers hiking poles, insect repellant and sunscreen to anyone needing them. Of course I take her up on the offer of hiking poles. The beginning of the Mt Cargill walk travels through lush, second growth forest. 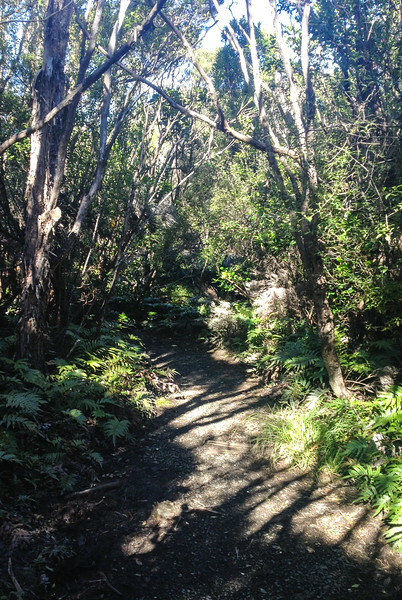 The Mount Cargill walkway ambles through dense second growth forest that introduces us to tree fuchsia, pepperwood, mountain cedar and lush ferns. Although the trail is marked as 1.86 miles round trip, it seems a bit longer to me. In the beginning, this New Zealand walk is an uphill, unpaved climb that includes occasional stairs, before reaching a long, level section of trail. A boomer with knee or hip problems might find the journey a bit challenging on the hilly portion, although hiking poles help alleviate shock on the joints. 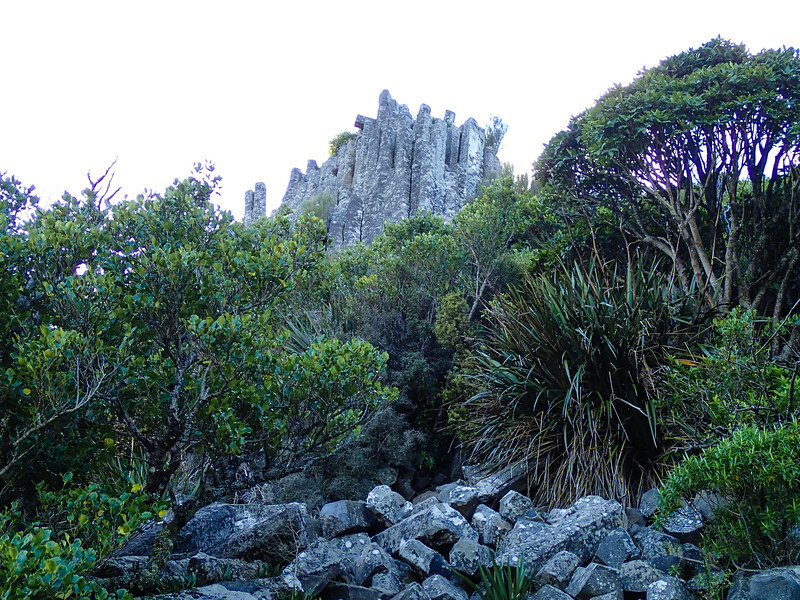 The Organ Pipes basalt formation is one of the highlights of a Mt Cargill walk. It isn’t long before we arrive at the Organ Pipes, basalt columns created by volcanic activity approximately 10,000 years ago. Most of our group scrambles around on the rocks, poses for photos and enjoys the view. I find it a little too steep for my comfort, preferring to hang back on the trail to watch the fun. From Buttars Peak, the Dunedin area is a patchwork of color. Soon the hike continues through native bush that becomes increasingly sparse, which opens up the view. After scrambling over a short, rocky section, we arrive at Buttars Peak, 2,000 ft. above sea level. Large rocks provide a place to sit, rest and take in the expansive views of Otago Harbour, Mount Kettle, Blueskin Bay, Mihiwaka, and the Silver Peaks. Our guide offers refreshments of coffee, tea, water and snacks before the return trip down the same path. A Mt Cargill walk leaves plenty of time to return to Dunedin to explore the city on your own before the ship leaves Port Chalmers in the afternoon. The Mt Cargill walk is a welcome change from life at sea and the nature break that Alan and I need. There are plenty of things to do in Dunedin, including active travel experiences like kayaking, guided walks, rafting and jet boating. And we’re still not done with New Zealand travel adventures on this cruise. A guided walk on Ulva Island is yet to come. 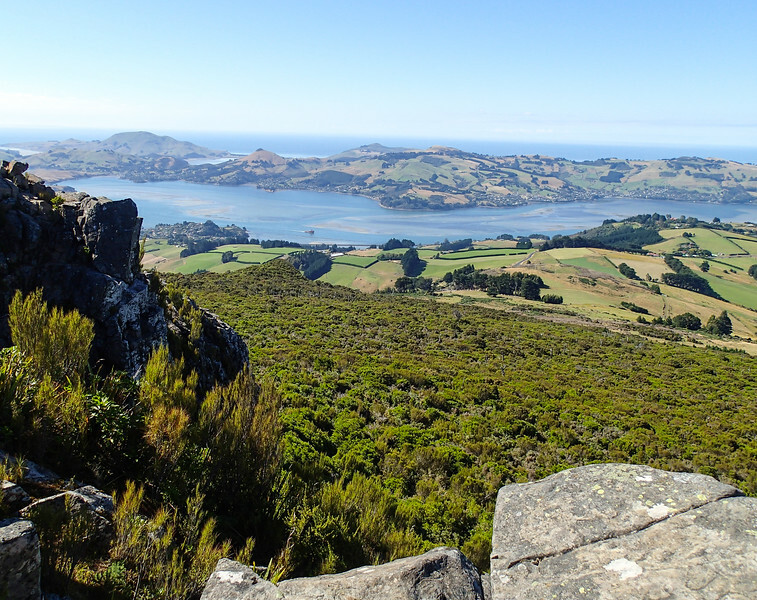 Did you enjoy a Mt Cargill walk while visiting Dunedin? Or do you have more New Zealand hiking adventures to share? Join the conversation at the My Itchy Travel Feet page on Facebook or send us an email to ask a question or share your experience. Planning a luxury cruise? Start your research with our Luxury Cruise Travel Resources.